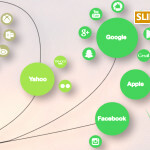 Which Companies Are Greening the Internet? When reading or opining online about the energy consumed by homes, cars and power providers, it’s easy to overlook the amount of electricity the Internet itself requires. According to a new Greenpeace report, the Web would rank sixth in energy demand if it were a country. The amount of Internet data out there is expected to have tripled from 2012 to 2017. In that time, the Web population is expected to grow from 2.3 billion in 2012 to 3.6 billion people by 2017, or half of the world’s population. With that sort of virtual volume on deck, Web companies have to become greener. In Clicking Clean: How Companies Are Creating the Green Internet, Greenpeace researchers make it clear which companies are leading the movement and which ones are still relying on fossil fuels. Greenpeace evaluated the energy choices of 19 familiar Internet companies and more than 300 of their data centers. Five of those firms have announced a goal of powering their operations with 100-perecent renewable energy. While all three companies are known for the renewable energy investments of recent years, Greenpeace particularly singled out Apple, the only company to earn a 100-percent score on its four-category Clean Energy Index. The company powers facilities like its Reno, NV data center with all clean energy, despite the local utility’s resource mix being more than half comprised of natural gas. The same goes Apple’s facility in Maiden, N.C., where 57 percent of the local mix is made up of nuclear energy. Apple’s North Carolina data center, which is home to the iCloud service, is powered by the largest privately owned solar installation in the country. Amazon and eBay, on the other hand, received 15 and 6 percent, respectively, on their indexes. Make a long-term commitment to become 100-percent renewably powered. Commit to transparency on IT performance and consumption of resources, including the source of electricity, to enable customers, investors, and stakeholders to measure progress toward that goal. Develop a strategy for increasing their supply of renewable energy, through a mixture of procurement, investment, and corporate advocacy to both electricity suppliers and government decision-makers. You probably haven’t seen electric vehicles (EV) get the type of primetime exposure they received Sunday evening on network television, but if Elon Musk has his way, they’ll soon become an undeniable part of our infrastructure. Musk, the CEO of EV maker, Tesla, was the subject of a 60 Minutes feature that brought his ideology to a large-scale viewing audience that he hopes is sick of high-emissions vehicles and steep gas prices. Though many like show correspondent Scott Pelley believe that Musk could impact cars the way Steve Jobs changed the face of computing and phone communication, Musk revealed that he initially thought the company would fail. The piece also touched on SpaceX, Musk’s firm that stands as the only private company to ever return a spacecraft from low-Earth orbit. He’s also chairman of SolarCity, which believes can help provide solar energy for the national network of Tesla EV chargers his company is creating. The luxury EV already gets about 250 miles on a charge. “I’m interested in things that change the world or that affect the future,” Musk said. Earlier this year, Musk spoke to CBS about the journey from New York to Los Angeles that Tesla personnel took two Model S sedans on, using only supercharger stations. This year, Consumer Reports named the Model S best overall car of the year, which certainly counts as a victory for EVs. For those who wanted to hear somebody besides a politician or environmental organization head discuss climate change, Rolling Stone provided as much in its March 27 issue. Bill Gates was the subject of an expansive question-and-answer interview that touched on the work of his family’s Bill & Melinda Gates Foundation, the evolution of computing from our desktops to pockets and much more. 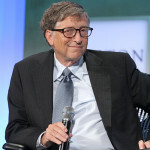 Given Microsoft’s efforts to go green and Gates’ steady standing as the world’s richest man, it only made sense to talk to him about what could the world’s biggest problem moving forward. Rolling Stone: Let’s talk about climate change. Many scientists and politicians see it as the biggest challenge humanity has ever faced. Gates: It’s a big challenge, but I’m not sure I would put it above everything. One of the reasons it’s hard is that by the time we see that climate change is really bad, your ability to fix it is extremely limited. Like with viruses, the problem is latency. The carbon gets up there, but the heating effect is delayed. And then the effect of that heat on the species and ecosystem is delayed. That means that even when you turn virtuous, things are actually going to get worse for quite a while. Right . . . we’re not virtuous yet, are we? We’re not even close – we’re emitting more CO2 every year. In order to get a 90 percent reduction of carbon, which is what we need, the first thing you might want to get is a year of global reduction, and we have not had that. U.S. emissions are down right now, partly because we buy more goods from overseas. But even if you invented some zero-carbon energy source today, the deployment of that magic device would take a long time. Are you hopeful that global climate talks will lead to a solution? Many climate-change discussions are off-target because they’ve focused on things like the $100 billion per year that some people believe should be spent by the rich world to help the developing world, which is not really addressing the problem. At the same time, discussion about how to increase funding of research-and-development budgets to accelerate innovation is surprisingly missing. We haven’t increased R&D spending, we haven’t put a price signal [like a carbon tax] in, and this is certainly very disappointing. I think it’s a real test of the boundary of science and politics—and an acid test of people’s time horizons. Before the economic downturn, attitudes in the U.S. about climate change had become quite enlightened, and then there was a big reversal, which I believe was a result of people’s worries about their immediate economic situation. Talking about problems that will have a significant effect 30 or 40 years out just gets off the agenda, and there’s this shrill political debate that is distracting people. So we’ve made some progress, but you can’t take the progress we’ve made and linearize it—if you do, you really are going to find out how bad climate change can be. Let’s say climate change was delayed 100 years. If that were the case, science would take care of this one. We wouldn’t have to double the Department of Energy budget, because there’s five or six different paths to go down. And 100 years, at the current rate and speed of science, is a long time. We’re heading for big trouble, right? Absolutely. That’s why I happen to think we should explore geo-engineering.­ But one of the complaints people have against that is that if it looks like an easy out, it’ll reduce the political will to cut emissions. If that’s the case, then, hey, we should take away heart surgery so that people know not to overeat. I happened to be having dinner with Charles Koch last Saturday, and we talked a little bit about climate change. And what was the conversation like? He’s a very nice person, and he has this incredible business track record. He was pointing out that the U.S. alone can’t solve the problem, and that’s factually correct. But you have to view the U.S. doing something as a catalyst for getting China and others to do things. The atmosphere is the ultimate commons. We all benefit from it, and we’re all polluting it. It’s amazing how few problems there are in terms of the atmosphere. . . . There’s just this one crazy thing that CO2 hangs around for a long, long time, and the oceans absorb it, which acidifies them, which is itself a huge problem we should do something about. Like cut carbon emissions fast. Yes, but people need energy. It’s a gigantic business. The main thing that’s missing in energy is an incentive to create things that are zero-CO2-emitting and that have the right scale and reliability characteristics. It leads to your interest in nuclear power, right? If you could make nuclear really, really safe, and deal with the economics, deal with waste, then it becomes the nirvana you want: a cheaper solution with very little CO2 emissions. If we don’t get that, you’ve got a problem. Because you are not going to reduce the amount of energy used. For each year between now and 2100, the globe will use more energy. So that means more CO2 emissions every year. TerraPower, which is the nuclear-energy company that I’m backing, required a very long time to get the right people together, it required computer modeling to get the right technology together, and even now it’s going to require the U.S. government to work with whatever country decides to build a pilot project—China, maybe. In a normal sort of private market, that project probably wouldn’t have emerged. It took a fascination with science, concern about climate change and a very long-term view. Now, I’m not saying it’s guaranteed to be successful, although it’s going super, super well, but it’s an example of an innovation that might not happen without the proper support. Nuclear power has failed to fulfill its promises for a variety of economic and technical reasons for 40 years. Why continue investing in nuclear power instead of, say, cheap solar and energy storage? Well, we have a real problem, and so we should pursue many solutions to the problem. Even the Manhattan Project pursued both the plutonium bomb and the uranium bomb—and both worked! Intermittent energy sources [like wind and solar] . . . yeah, you can crank those up, depending on the quality of the grid and the nature of your demand. You can scale that up 20 percent, 30 percent and, in some cases, even 40 percent. But when it comes to climate change, that’s not interesting. You’re talking about needing factors of, like, 90 percent. But you can’t just dismiss renewables, can you? Solar is much, much harder than people think it is. When the sun shines, electricity is going to be worth zero, so all the money will be reserved for the guy who brings you power when there’s no wind and no sun. There are some interesting things on the horizon along those lines. There’s one called solar chemical. It’s very nascent, but it comes with a built-in storage solution, because you actually secrete hydrocarbons. We’re investing probably one-twentieth of what we should in that. There’s another form of solar called solar thermal, which is cool because you can store heat. Heat’s not easy to store, but it’s a lot easier to store than electricity. Given the scale of problems like climate change and the slow economic recovery and political gridlock and rising health care costs, it’s easy for people to feel pessimistic about the way the world is going. Really? That’s too bad. I think that’s overly focusing on the negatives. I think it’s a pretty bright picture, myself. But that doesn’t mean I think, because we’ve always gotten through problems in the past, “just chill out, relax, someone else will worry about it.” I don’t see it that way. I think we will get our act together on climate change. That’s very important. I hope we get our act together on large-scale terrorism and avoid that being a huge setback for the world. On health equity, we can reduce the number of poor children who die from more than 6 million down to 2 million, eventually 1 million. Will the US political system right itself in terms of how it focuses on complex problems? Will the medical costs overwhelm the sense of what people expect government to do? When you look on the horizon over the next 50 years, what is your biggest fear? I think we will get our act together on climate change. That’s very important. I hope we get our act together on large-scale terrorism and avoid that being a huge setback for the world. On health equity, we can reduce the number of poor children who die from more than 6 million down to 2 million, eventually 1 million. Will the U.S. political system right itself in terms of how it focuses on complex problems? Will the medical costs overwhelm the sense of what people expect government to do? I do worry about things like the war in Syria and what that means. You wouldn’t have predicted that that country in particular would fall into horrific civil war where the suffering is just unbelievable, and it is not obvious to anybody what can be done to stop it. It raises questions for somebody who thinks they can fix Africa overnight. I understand how every healthy child, every new road, puts a country on a better path, but instability and war will arise from time to time, and I’m not an expert on how you get out of those things. I wish there was an invention or advance to fix that. So there’ll be some really bad things that’ll happen in the next 50 or 100 years, but hopefully none of them on the scale of, say, a million people that you didn’t expect to die from a pandemic, or nuclear or bioterrorism. What do you say to people who argue that America’s best days are behind us? That’s almost laughable. The only definition by which America’s best days are behind it is on a purely relative basis. That is, in 1946, we made up about 6 percent of humanity, but we dominated everything. But America’s way better today than it’s ever been. Say you’re a woman in America, would you go back 50 years? Say you’re gay in America, would you go back 50 years? Say you’re sick in America, do you want to go back 50 years? I mean, who are we kidding? Our modern lifestyle is not a political creation. Before 1700, everybody was poor as hell. Life was short and brutish. It wasn’t because we didn’t have good politicians; we had some really good politicians. But then we started inventing—electricity, steam engines, microprocessors, understanding genetics and medicine and things like that. Yes, stability and education are important – I’m not taking anything away from that—but innovation is the real driver of progress. At first glance, you might mistake the potential future of wind energy as a blimp—the type of added effect perfect for flying over a carnival or football game. Instead, the BAT—Buoyant Airborne Turbine—is a wind turbine inside of an inflatable, helium shell capable rising 1,000 feet above ground. 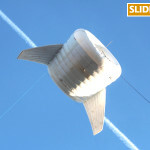 Altaeros Energies, a firm housed at small business incubator Greentown Labs near Boston, MA, is deploying the BAT as part of an 18-month, $1.3 million project in Alaska as the first-ever commercial, high-altitude wind turbine demonstration project. The 1,000-foot height would also qualify as a record for the tallest wind turbine. At that height, the BAT would be about 275 feet taller than the current record holder for the highest wind turbine, the Vestas V164-8.0-MW, which was installed as a prototype at the Danish National Test Center for Large Wind Turbines in Østerild, Denmark. Last year, Altaeros successfully tested a BAT prototype in 45 mile-per-hour winds, 500 feet above its test site in Maine. Altaeros CEO Ben Glass says the BAT represents a breakthrough in wind energy when compared to what he views as “incremental” improvements in the industry’s technology. That’s partly because it makes use of strong winds at heights that promise to generate more energy than the average turbine. The device’s tethers are designed to hold the BAT steady and send electricity to the ground. Altaeros is targeting off-grid areas, including island communities and disaster relief zones. The demonstration project is funded through a partnership with the Alaska Energy Authority and private investment from Ratan Tata. Additional funding comes from the National Science Foundation, the California Energy Commission, and the ConocoPhillips Energy Prize. The company says the BAT can be transported and set up without large cranes, towers or underground foundations. Glass formed Altaeros with Adam Rein, a Greentown Labs board member, a few years ago while the two studied at the Massachusetts Institute of Technology. Springtime is the time of year where we start to see the first signs of growth; the green shoots of what will turn into a verdant garden or a bountiful harvest. As the first quarter of 2014 comes to a close, we are seeing some encouraging signs that both electric vehicle sales and their benefits will continue to grow this year. Toyota and Hyundai will be rolling out their new fuel cell vehicles within a year. Hyundai’s hydrogen-powered SUV will be leased in Southern California starting this spring and Toyota will follow with a sporty sedan in early 2015 in “significant numbers,” according to the manufacturer. 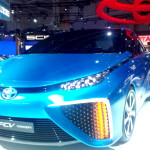 Hydrogen fuel cells marry the advantages of clean, efficient electric vehicles with the convenience of fast refueling. Hydrogen made today from natural gas gives about the same total emissions per mile as charging a plug-in vehicle with electricity generated from natural gas. But hydrogen can (and will, based on California’s renewable hydrogen requirements) also be made from renewable sources like biomass and solar power, so in the future hydrogen-powered vehicles will be even cleaner. A key advantage of hydrogen fuel cell vehicles is that they can be refueled at a filling station in a short time. This means that drivers who would rather not plug in a battery electric car can still use a clean electric motor to get around. The filling time is about the same as a gasoline vehicle, about five to ten minutes for a 300-mile range. Sales of EVs, including both plug-in hybrids and battery electrics, continue to rise. More than 90,000 EVs were sold in the U.S. in 2013—more than double 2012 EV sales. In California, sales of EVs also increased more than 100 percent in 2013 compared to the previous year, and the state was home to nearly half (46 percent) of all new plug-in vehicles in the U.S. In 2013, plug-in cars were 2.5 percent of new vehicle sales in California. Looking forward to 2014, new models of EVs will hit showrooms this year. BMW is already reporting significant interest in its upcoming battery electric i3 car and other EVs from Kia, Cadillac and VW are either in showrooms or on the way. As new models and types of electric vehicles become available, consumers will have more choices to reduce fuel costs and emissions than ever before. Electric vehicles are reducing oil consumption and global warming emissions while saving consumers millions of dollars at the pump. Americans have purchased almost 170,000 plug-in vehicles in the last three years. These vehicles are avoiding the burning of 45 million gallons of gasoline per year and saving Americans over $100 million per year in avoided fuel costs. Californians have saved the most, cutting $40 million in annual fuel costs and reducing emissions of carbon dioxide by 140 thousand tons per year. If the spring’s trends continue, these benefits will only increase.